This culinary wizard has taken a step further by opening the latest outlet - Taste Paradise @ ION Orchard is the latest addition to the expanding portfolio of the Paradise Group. 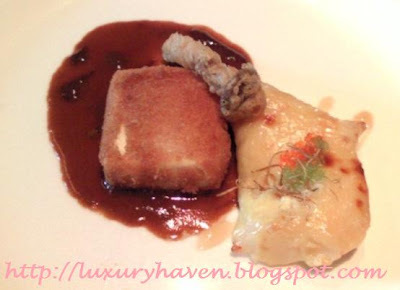 I was there during lunch to sample the 5-course Executive Set Lunch @ S$55++ per person. I was surprised to see the full-house restaurant as I was ushered to my seat. This fine dining outlet is somewhat different from their other humble branches. I was smiling to myself when I saw my seat, which was away from the dining hall. It was a cozy 2-4 seater with individual curtains for privacy. Wow! The first hurdle has already raised my standard & I was hunger for more. 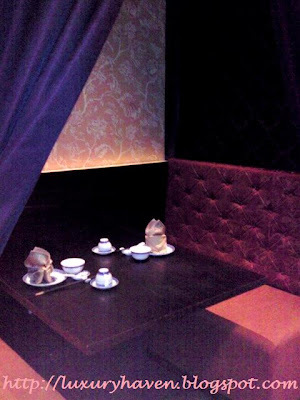 I was too, impressed at the wide range of Ala Carte menu, which looks so intriguing. Pan-seared Foie Gras & Peking Duck Salad. 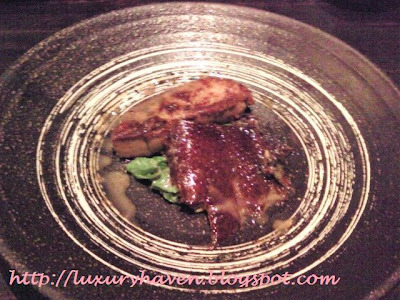 This is one of the few Chinese restaurants where you'll find the Foie Gras delicacy. At S$55 for the entire course, this is a steal! This East-meets-West starter was delightfully pleasing & bursting with flavours. 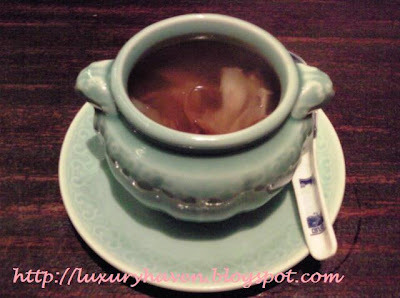 Double-boiled Cordyceps’s Flower Soup with Shark’s Fin & Deer’s Tendon. As my friend is non-Chinese, I was afraid this herbal soup might not take to her liking. Surprising, the taste of Cordycep was rather mild & the soup packed a punch. She liked the soup so much that she has finished the entire bowl. Baked fillet of Cod. This dish was paired with with Crispy Tofu & served in the Chef’s miso recipe on a bed of Black Truffle Reduction. Nothing spectacular but I've no complaints. 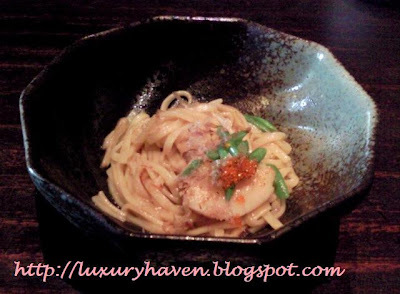 Wok-fried Ramen was the Oriental version of Linguine served with pan-seared Scallop in shrimp stock. The noodle was a bit soggy, somewhat over-cooked. I don't quite fancy this ramen. 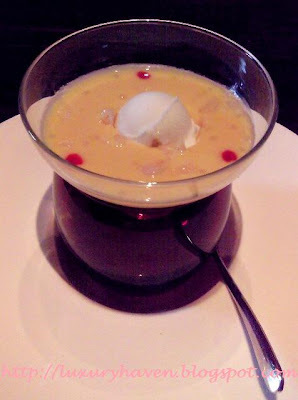 Chilled Mango Puree arrived at our table in a fanciful bowl within a glass. They could’ve done better by adding eg. dry ice effect, as I was expecting something interesting seeing upon this attractive serving glassware. The dessert has bits of Sago & Pomelo & coupled with my fave Coconut ice-cream. Creamy & sweet.